Laffa or Lafa or Lafah is an Iraqi pita that is of medium thickness, slightly chewy, doesn't tear easily, and is mostly used to wrap shawarma in food stands. Druze pita is paper thin and traditionally spread with Labneh (a white Middle Eastern yoghurt cheese made from cow milk), olive oil, and/or zaatar (a condiment, used in Arab cuisine, made from the dried herbs, mixed together with sesame seeds, and often salt, as well as other spices). Bukharan pita, an oval, thin and crispy flatbread, spiked with cumin seeds. Usually eaten as a snack by Bukharan Jews, along with savory food. Taboon bread is a staple of Arab Middle Eastern cuisine worldwide, and found in Arabic restaurants. It is used in the popular Palestinian dish musakhan. Mix all of the dry ingredients together in the bowl. Add the water, while squeezing it into the flour mixture, until it forms a soft, pliable dough. If it is a little wet, add a little flour, but not too much. Knead the dough, by hand, on a floured surface for at least 5 minutes. The object is to get as many bubbles as possible into the dough, so the more time you take with it, the better. 10 minutes is ideal. Put the dough back in the bowl, cover the it loosely with a cloth, and if it is a hot day, let rise for 1 hour, until it is doubled in size. On a cold day, it may take up to 3 hours. While you are waiting, lay out the lint free cloth, and place the plate on it. Gather the corners of the cloth, and tie the opposite ends together, or use a rubber band. Make sure the cloth is securely around the plate. The gathered ends will be your handle, and the other side will be where you spread your lafah dough. Dust your lafah spreader (the plate with the cloth you just adjusted) with flour. Preheat your grill to high heat when the dough is almost ready. When the dough has risen, grab a medium handfull of it, and gently roll it into a ball. Press the ball gently in the middle, and "massage it" outwards, using your thumbs, to stretch it out. When it gets to about the size of a patty, place this on the flat side of the lafah spreader you made, and gently stretch it farther out, while rotating it, until the outer edges of the dough hang over the sides. You can keep going, and make them very big, once you get the hang of it. Flip the lafah off of the plate, and onto the hot grill. Once the lafah begins to bubble, it is time to turn it over. This will not take very long, so be watchful. In about the same amoung of time, it should be done on the other side. When you remove them from the grill, put them on a plate that is covered with cloth, and cover them with the cloth. Lafah can be used for many dishes. It can be a holder for shauarma (thinly sliced roasted meat), or a savory vegetable salad, or sprinkled with cinnamon paste and sugar just as easily. Lafah should be eaten on the day they are made, for the best taste, but they can be stored in a bag in the freezer for later, after they are cooled. Lafah should not be confused for Iraqi or Druze pita. Iraqi and Druze pita are made without yeast. They are "soured" or fermented using the normal chemistry of flour and starch. Iraqi pita is similar in thickness to flour tortillas. 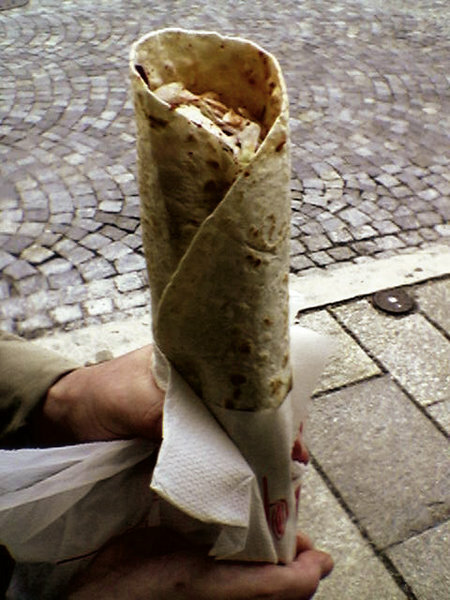 Druze pita (also called sagg pita) is very thin and large. Both Iraqi and Druze pita are baked on a convex pan called a taboon, resembling an overturned wok.